Pug Dog Information " "
Pugs are playful, perky and charming dogs. They are often rambunctious but are quite loyal. Overall the Pug has proved to be an affectionate dog with a happy disposition. Pugs are not fond of barking and are very sociable canines. They enjoy the company of children, strangers and other family pets. They are intelligent and are happiest when with their owners. The Pug makes a wonderful companion for anyone looking for a devoted companion that is easy to love. To this day, historians can not agree on when Pugs first came into existence. The earliest records of the breed only date back to 400 B.C. 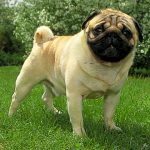 Nevertheless, regardless of the mysteries tied to the dawn of their existence, historians believe that the Pug originated in the Orient, as the Pug and the Pekingese have highly similar characteristics. China is the first nation to be recorded having the ancient Pug which was known as a “foo dog” at the time. Pugs were companions of Tibetan Buddhist monasteries and of Chinese Emperors. After the passing of many centuries Pugs finally made their way from China to Japan and then to Europe. In fact, Holland was the first European nation where the Pug became popular. Their popularity started during the 1500s when a Pug saved Prince William of Orange’s life by alerting him to the approach of Spaniards. To show his appreciation to his dog, William of Orange made the Pug the official dog of the House of Orange. By the late 1700’s the Pugs popularity stretched from England to France. 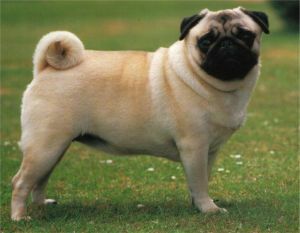 Then in the 19 th century China imported the first black Pug to Britain. Not long after this exchange, the American Kennel club registered Pugs in 1885. Pugs continue to remain a well loved and celebrated breed even now. Pugs are often described as plenty of dog in a small space. They weigh an average of 13-20 pounds and grow to 12-14 inches at the shoulder. They are apart of the Mastiff or Toy dog group and are one of the only breeds listed in this group to be exceptionally fond of children. This makes them an ideal family pet. Along with loving children, the Pug does not mind the company of other pets and is incredibly sociable with strangers. That being said, Pugs make fine watchdogs and will alert their owners to strange noises or visitors. Nevertheless, the Pug is only a casual barker and isn’t a yapper. 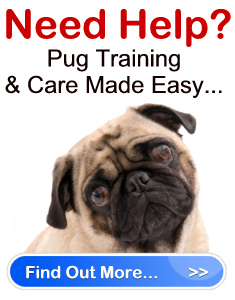 Pugs can be a little head strong and willful at times, especially when it comes to training. However, with gentle and persistent teaching they fair well. Don’t mistake a Pugs stubborn nature to unintelligence. This breed is exceptionally smart. A Pug is happy living wherever their owner goes. Furthermore, they are not incredibly active. Therefore, Pugs do well in apartment life. Nonetheless, you should keep in mind that although this dog isn’t one for exercise, it is imperative that you encourage him to remain active, as he can become overweight easily. Make sure you take your Pug out for a nice walk at least once a day (good 10 minute walk) and play with him whenever you can. Just make sure you don’t over do it. 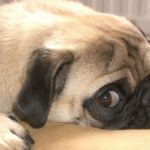 Due to the makeup of their muzzle, Pugs can easily lose their breath and may start to wheeze if not getting enough air. If you catch your dog doing this, immediately stop to allow him to catch his breath. Although the Pug has a decent life span of 12-15 years, they have many health problems you need to be aware of. For instance, Pugs are extremely sensitive to hot and cold temperatures. The can easily catch colds. In addition, the Pug is prone to many allergies because of his exceptionally short muzzle. They are also prone to eye and skin problems and obesity. Aside from the health issues, Pugs are very easy to care for as far as grooming is concerned. He only requires brushing once or twice a week, but the folds on his face should be cleaned on a regular basis. In addition, the Pug sheds extensively during shedding season. 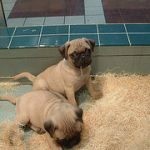 Pugs are a wonderful choice for a first time dog owner, but you must be willing to provide this sensitive breed with the special care he needs. As long as you can give him the love and care he requires, you’ll have a healthy dog as a companion for a long time.